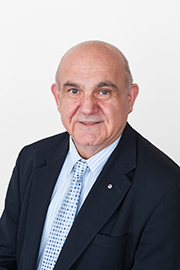 As a long-term resident of Manningham, Cr Zafiropoulos (AM) has a genuine interest in the concerns of residents and is committed to preserving and improving the amenity of the City, Council services, public transport and urban design. He is a former Mayor of Fitzroy and has executive experience in the Federal Public Service and as the former General Manager of the Special Broadcasting Service (SBS). He serves the Manningham community as a JP and has chaired several not-for-profit boards, including a local aged care provider. Since 2003, he has been an Australia Day Ambassador, served on Council's Access and Equity Committee and on an advisory committee to the Minister for Small Business, Innovation and Trade. He received the Order of Australia (AM) for his extensive voluntary work and is keen to directly serve the local community.